Throwing the term “mod” or “contemporary” before a particular class of cuisine is typically an offhand branding strategy just to make a place seem more hip. When Flying Monkey proffered us the same promise applied to Indian food and cocktails, there was a hint of skepticism that led to us scrolling through their menu prior to heading down. 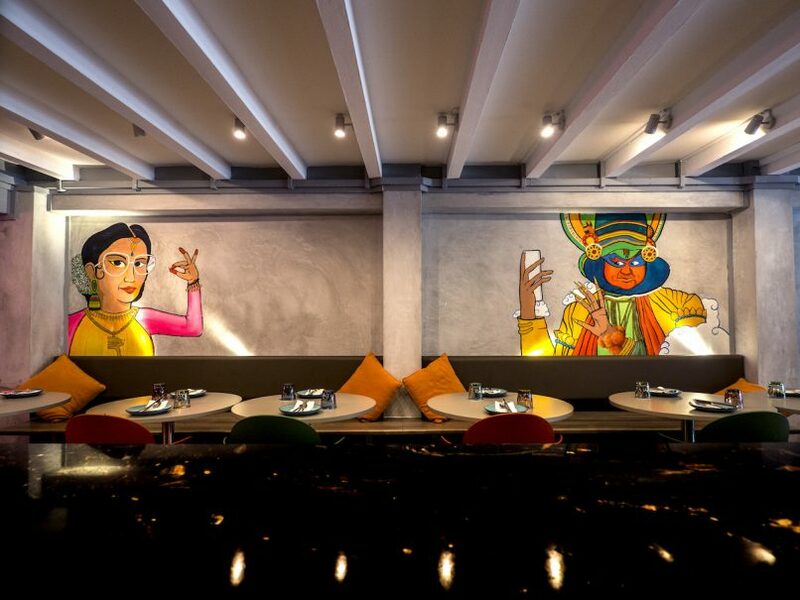 It was certainly contemporary, as authentic Indian cuisine staples like naan and curries had an interesting ingredient or two, while the cocktails were a world unto their own. A mango and passionfruit lassi with vodka and rum? Jasmine-infused gin? Sign us the heck up. Here’s how Flying Monkey lived up to the curiousity. 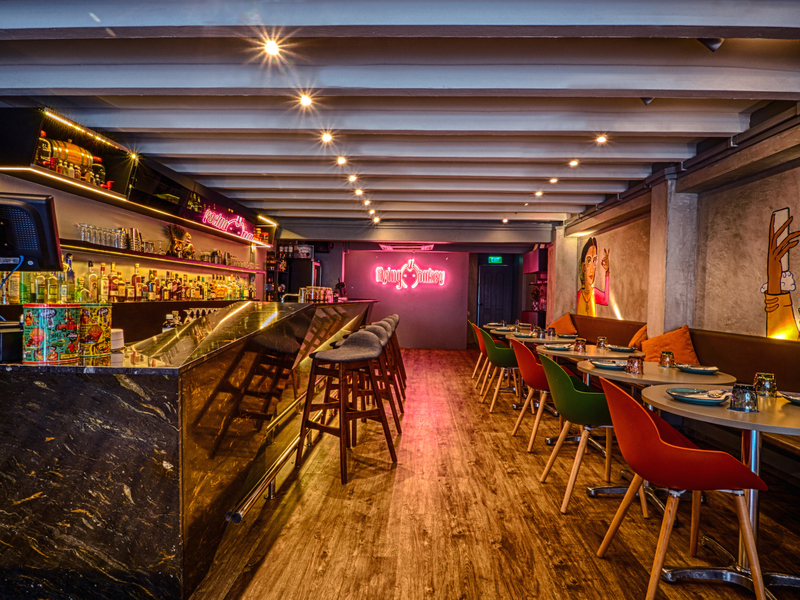 A place that promises pan-Indian flavours and classic cocktails with an Indian twist comes across unorthodox right off the bat. We’ve seen the classics redone with Asian herbs, and the occasional injection of Indian spices, but this was a whole new world. The bar is helmed by Kannan Pilai, formerly of Cufflink Club, Longplay and Tippling Club. The ambience is one that reflects the multi-faceted variety of Indian culture. It’s not stingy on the colour, with bright murals dotting the walls and a welcoming neon sign, nor does it skimp on monkey paraphernalia. You’ll find little chimps all over Pilai’s bar, which could make for a fun (or disastrous) spot-the-monkey drinking game. Classic rock n’roll dominates the stereo — another cool, irreverent tick on Flying Monkey’s list of quirks. It isn’t just Indian flavours that go into the cocktails. Traditions and Pilai’s family recipes all come into play behind the bar counter. There are nine house cocktails on the menu, and none come with sugar or sweeteners, as Pilai’s experiences taught him that people aren’t usually fans of cocktails that are too cloying. Instead, he relies on ingredients like coconut water, fruit, honey and cinnamon to bring on the sugar. 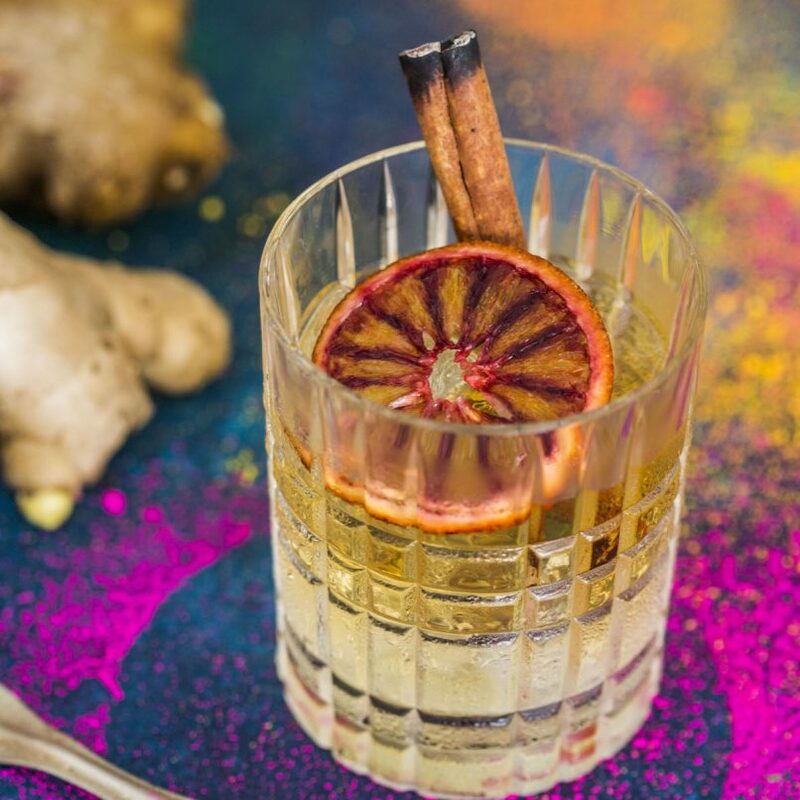 The Flying Monkey is their signature cocktail, made from Monkey Shoulder whisky, ginger, jaggery syrup and bitters, served with a charred cinnamon stick. It lacked the prominence of the ginger we craved, but it is nonetheless an interesting spin on an Old Fashioned. Our personal favourites were Mind It!, a jasmine-infused cocktail with maple syrup, fresh mint and lemon, served in a tiny metal bucket reminiscent of the serving ware one would find in an Indian temple or wedding. It’s a light opener to the evening, and the jasmine notes truly shine. If you want something heavier, the Goa Mamma Lassi is a thick, creamy mix of mango, passionfruit and yogurt, cut with vodka and rum. 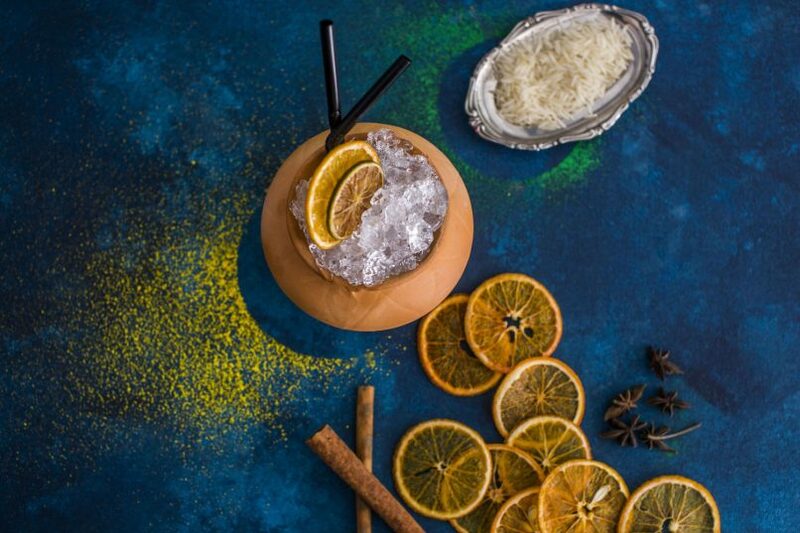 Their Yo Yo Mani, made with white and coconut rum, coconut water and cream, as well as Pilai’s five spice Kerala rice syrup, is a refreshing, well-balanced drink that reminded us of makgeolli, but better. If you’re craving a bit of theatrics, order the Monkey On Fire, a warm whisky and coconut water cocktail that Pilai sets on fire, and tariks the glowing blue ribbons of booze before your eyes. A+ for showmanship. Flying Monkey also serves barrel-aged cocktails, beers, white and red wines. Pilai also takes bespoke cocktail requests. The dishes come to the table looking simple, but are packed to the brim with complex, rich flavours. You get typical Indian dishes like butter chicken, fish curry, tandoori chicken, and slow-cooked lamb shank, with other interesting morsels to explore. Owner Sumeet Singla explains that the diversity of dishes on the menu is partially due to having chefs from each region of India behind the kitchen. 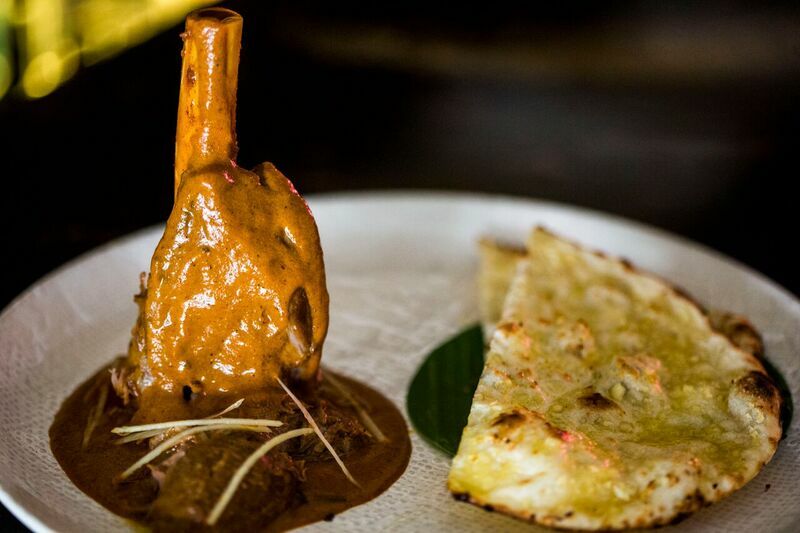 The Nalli Gosht is slow-cooked lamb shank that falls off the bone, served with fluffy varqi pratha. We were cynical about the truffle naan, but it proved the highlight of the night. Truffle paste is slathered sporadically on freshly-baked naan bread, and served with paneer mousse and peach chutney. It’s a savoury and sweet treat that truly exemplified Flying Monkey’s contemporary approach to Indian food. Another discovery was their fried okra, which we believe is our new favourite bar snack. Paper-thin okra wafers are deep-fried in spice batter, making it ridiculously addictive to munch on. Have that and a couple of pints with their spicy calamari, and you’re all set for satisfaction. If you’re yearning to try something new, you ought to pay Flying Monkey a visit. A relaxed atmosphere, top-notch grub and fun cocktails makes this a compelling place you’d want to return to. Flying Monkey is located at 67 Bussorah St, S199480, +65 6291 0695, www.flyingmonkey.sg.